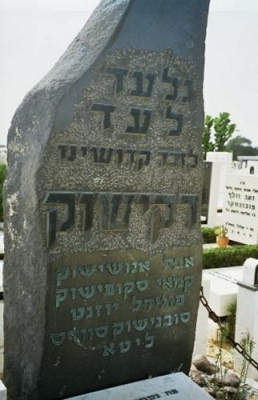 Philip Shapiro, Rokiskis SIG member, spearheaded a project to restore the Rokiskis Jewish cemetery. 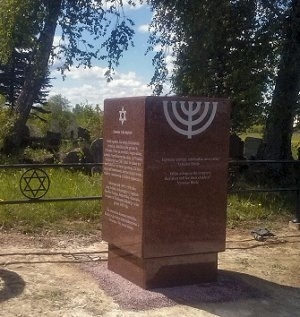 He, his wife Aldona, his family members, and Lithuanian friends have applied for and received government permission, raised funds and gotten a fence built around the cemetery. Phil, we are all grateful for your dedication and hard work. 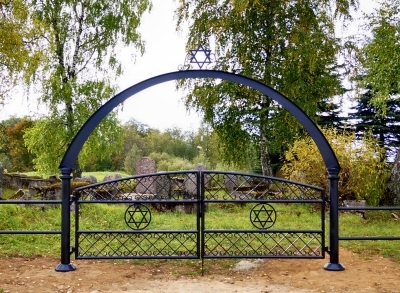 In 2013, Remembering Rakisik Jewry, LLC, and its parent, Remembering Litvaks, Inc., (together, “RLI”) commissioned the Rokiškis Machine Factory (Rokiškio mašinų gamykla, AB) to design and install a new gate and a section of fence along the eastern side of the Old Jewish Cemetery in Rokiškis. (The machine factory was founded by Rokiskis’ prominent Zamet family.) 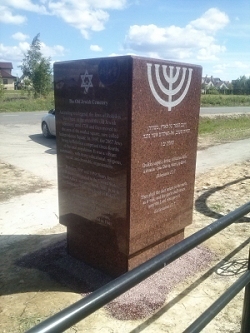 RLI then commissioned Ponevezh sculptor Albertas Jasiūnas to create an engraved memorial stone, which was installed in May 2014 immediately outside of the new gate. Click here or on photo to see a larger version and read the inscription on the monument..